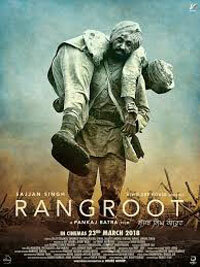 Rangroot…..After seeing the movie I literally cried from my heart for Sajjan Kumar and likes (13.83 Lakh Indian soldiers out of which 1.11 lakh were martyred and unceremoniously forgotten (No war memorial for them till date) who envisioned freedom of Bharat in early 20th century and to fulfill their ambition joined Indian British army at behest of Mohandas K Gandhi to fight against Germans in the World War. It is strange the European war between Britishers and Germans had disillusioned Indian soldiers who were fighting that battle thinking they will be rewarded with Freedom of Bharat after victory in Europe at the behest of Mohandas Gandhi who was preaching 100% Ahimsa (Non violence) in India. So in Bharat the Indians were told to follow ahimsa against Britishers torturous ways and outside India Mohandas was preaching the Indians to take to arms and fight violently for the Britishers shoulder to shoulder against the more powerful Germans in various parts of the world. Gandhi was definitely fooling the Indian masses to appease the Britishers. Following the policy of Divide and Rule which he successfully achieved also. He preached Violence to Indians in Europe to support Britishers and Non Violence to Indians in India to suffer atrocities of Britishers in India. After a whole night with series of thoughts finally here is what I concluded. Mohandas Gandhi joined freedom struggle in 1915 and in 1918 defying his theory of Non Violence. He urged and campaigned aggressively for Recruiting Indians in Indian British Army to fight shoulder’s to shoulder’s with Britishers in 1st World War in Europe.13.83 lakh Indian soldiers were recruited to fight violent battles in Europe during first World War. 1.11 lakh or 111000 soldiers lost their lives taking to arms. No WAR MEMORIAL for them till date. Sajjan Singh a brave soldier who laid down his life in France fighting for Britishers against Germans was one of them. Till last moment the Indian soldiers suffered humiliation in every front but still remained faithful to the Britshers. That was the true face of Gandhi- he was therefore not a nonviolent leader as he has been projected. He was deeply impressed and 100% loyal to Britishers and blindly followed their orders to appease them. So in both ways the Indians were suffering in India they were told to surrender and not retaliate against the Britishers and strictly follow Ahimsa on the other hand in Europe he asked Indians to fight fierce battles and win war by sacrificing their lives in support of Britishers against Nazis. Though how he was able to play double standard is still a mystery. Everyone was mesmerized and all the Indians surrendered and followed his commands blindly, and those who didn’t follow him like Bhagat Singh , Subash Chandra Bose and likes were eliminated. He signed Irwin Pact a political agreement signed by Mahatma Gandhi and the then Viceroy of India, Lord Irwin on 5 March 1931 and very meticulously planned execution of Bhagat Singh on 23 March 1931. During 2nd World War when Subash Chander Bose was busy preparing Indian national Army to fight against Britishers Gandhi was again busy recruiting Indians in Indian British Army to fight for Britishers against Nazis and Japanese. INC members were also not organized as Freeedom Fighters by successive governments.Had Gandhi remained neutral or fought against Britishers we would have got independence in 1919. Britishers rewarded Mohandas Gandhi for Recruiting 13.83 Lakh Indian soldiers of Indians in 1st World war by Massacring innocent children women and men @Jallia Wala Bagh in Amritsar. Sajjan Singh and likes would have been highly disillusioned after seeing their sacrifice made in World War simply ignored and Britishers in return brutally rewarded them by killing their own brother’s and sisters in Amritsar. Previous articleIS HIMACHAL GOVERNMENT BUILDING ROADS FOR PARKING?